The Nokia X1-01 comes with a simple music player and FM radio. The music player is pretty basic but it can browse the songs on the memory card with relative ease. It also supports folders, which is a good way to organize your music. The phone lacks a gallery app and the music player can't move files, so you'll have to do that on a computer. There are a number of things missing from the player - for one, it only supports MP3 and no other format. You also don’t get an equalizer and there's no search function or filtering tracks by album/artist/genre. The dedicated music keys are a good addition though and can be used to control playback, but you can't fast-forward/rewind tracks. The MP3 player can work in the background and while a track is playing, its name appears on the homescreen. Unfortunately, there's no way to adjust the volume while at the homescreen - there's no volume keys and all the other keys are assigned different functionality. The Nokia X1-01 also features a Stereo FM radio. The auto-tune feature will scan all frequencies to find all stations in your region and remember up to 30 of them. You can set a name for each station, but you have to do it manually as the radio doesn’t support RDS. There's no list with all stations either - you need to use the next/previous keys (the music keys) to change between saved stations. Anyway, one nice feature is Radio clock - the phone can be set as any radio clock and will wake you by tuning into the selected station. You'll need to leave the headset plugged in however, as that serves as the radio's antenna. The Nokia X1-01 is a pretty easy handset to review. It's a simple phone and it's not ashamed of it - calling from (and receiving calls to) two SIM cards is its primary function and it does that easily. We just wish it was the second SIM that was hot-swappable, not the microSD card. Still, if you get one SIM with cheap calls and one with cheap text messaging, you can do quite a bit of chatting in a month, without inflating your phone bill. Not that texting on that keyboard is particularly easy. Anyway, the Nokia X1-01 was designed for emerging markets and not only is it very affordable, it can easily be shared between the whole family, thanks to its multiple phonebooks. Nnaming SIMs and assigning them icons is a neat perk as well, while the massive standby and talk times are the other highlights of the phone - you can go for days without needing to charge. A vital feature in regions where constant electrical supply isn't available. The flashlight and powerful loudspeaker with MP3 player and FM radio in tow really boost the value for money of the phone too. The S30 software, however, is very limited in terms of extra features. The X1-01 is far from your only option, though. The Nokia C2-00 is a bit pricier, but a hot-swappable second SIM and more flexible S40 software make a strong case for getting that instead of the X1-01. The old C1-00 is also an option, but you lose the dual-standby functionality and the music player, too. For other alternatives, you need to look to less popular brands. The X216 and X128 are here to fight for the Philips brand, while the ZTE R211 is also worth a look. Maybe, you'd be better off getting an old model second hand - it's won't break the bank either and it will have better specs. Like, for example, the Samsung D880 Duos, which is no longer in production, but has a 2.3" QVGA screen and a 3MP camera. Still, in terms of absolutely minimal price for a new dual-SIM, dual-standby handset, nothing beats the Nokia X1-01. 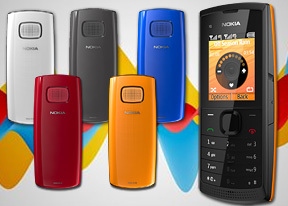 It's among the cheapest phones by Nokia and is very good at the being-just-a-phone game.